SAN JOSE, Calif. -- The San Jose Sharks are in a freefall at most inopportune time. D Dylan McIlrath made his long-awaited Red Wings debut. The 26-year-old was acquired from Florida in a March 1, 2017, trade. . F Thomas Vanek (mid body) was scratched and C Michael Rasmussen (upper body) missed his second straight game. ... D Jonathan Ericsson (lower body) returned to the lineup after missing four games. . D Brian Lashoff was sent to Grand Rapids (AHL). ... Sharks All-Stars C Joe Pavelski (lower body) and D Erik Karlsson (groin) missed their fourth and 12th straight games, respectively. . F Barclay Goodrow appeared in his 200th game. . 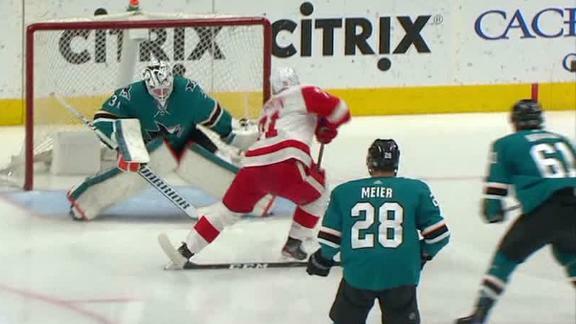 Sharks F Gustav Nyquist faced Detroit for first time since being traded to San Jose on Feb. 24. Dylan Larkin and Andreas Athanasiou each score to lead the Red Wings over the Sharks 3-2.